SAN JOSE, Calif. (KGO) -- A search is underway for an SUV that plunged into the Eel River south of Humboldt County's Garberville that officials say matches the description of a vehicle belonging to a Southern California family that's been missing since April 5. 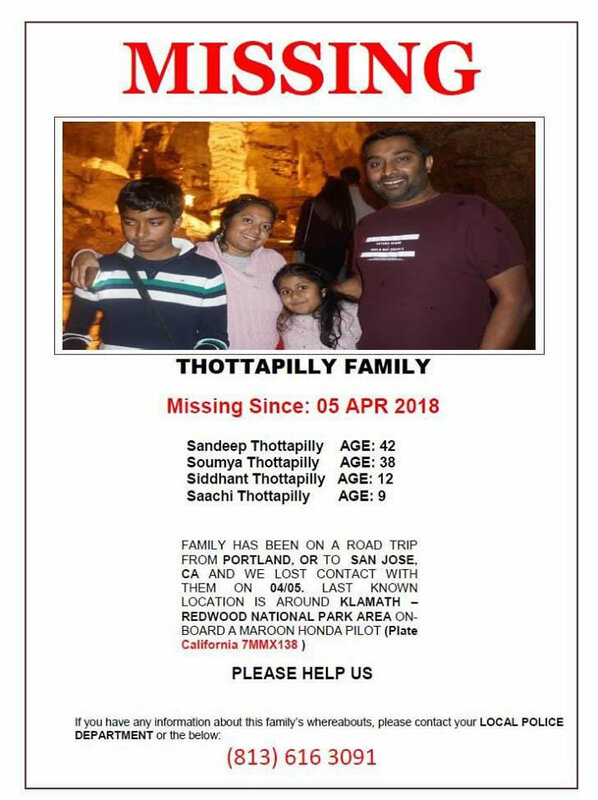 The Thottapilly family from Valencia -- 42-year-old Sandeep, 38-year-old Soumya, 12-year-old Siddhant, 9-year-old Saachi -- vanished while on a trip home from Portland. Relatives say the family stopped communicating on Thursday and they're concerned because the four were supposed to stop in San Jose on Friday for a quick visit with family or friends, but they never arrived. The CHP says a witness called 911 last Friday around 1:30 p.m. to report seeing a car go over a 100-foot embankment south of Garberville in Humboldt County. The Eel River runs parallel with the two-lane Highway 101 at that point. CHP Public Information Officer William Wunderlich from the Garberville office said there are similarities between that vehicle and the family's car, including the color. They were supposed to have arrived in San Jose that day, but never arrived. Wunderlich notes that it was raining on Friday and no one has seen the car since that time. Right now, he says the river is running high, swift and cold. He does not think the level will go down for another couple of days but adds that they will not stop searching until there is a break in the case. The family's last known location, in their maroon Honda Pilot, was around Klamath in the Redwood National Park area. A family friend said the Thottapillys were excited about taking the trip. "They were just going on a road trip and they were very excited. Very excited to do the Oregon Trail," said friend Laura Knightley. #MORE: The #Thottapilly family was last heard from on Thursday. They were driving to #SouthernCalifornia from #Portland, OR and were supposed to arrive in #SanJose on Friday for a quick stay with family and/or friends, but never arrived. Relatives tell me they're very concerned. She said she last heard from them when they sent pictures of the kids in Sacramento on March 30. Other family members last heard from them April 5. Sandeep's brother is driving up to Northern California to meet with the CHP as officials investigate the report of the vehicle that fell off the 101. Chris Nguyen will have the latest on this developing story on ABC7 News. Click here to follow his updates on Twitter.